Solar flares are giant explosions on the sun that send energy, light and high speed particles into space. These flares are often associated with solar magnetic storms known as coronal mass ejections (CMEs). The number of solar flares increases approximately every 11 years, and the sun is currently moving towards another solar maximum, likely in 2013. That means more flares will be coming, some small and some big enough to send their radiation all the way to Earth. The biggest flares are known as "X-class flares" based on a classification system that divides solar flares according to their strength. The smallest ones are A-class (near background levels), followed by B, C, M and X. Similar to the Richter scale for earthquakes, each letter represents a 10-fold increase in energy output. So an X is ten times an M and 100 times a C. Within each letter class there is a finer scale from 1 to 9. C-class and smaller flares are too weak to noticeably affect Earth. 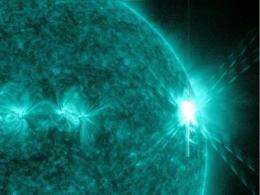 M-class flares can cause brief radio blackouts at the poles and minor radiation storms that might endanger astronauts. And then come the X-class flares. Although X is the last letter, there are flares more than 10 times the power of an X1, so X-class flares can go higher than 9. The most powerful flare measured with modern methods was in 2003, during the last solar maximum, and it was so powerful that it overloaded the sensors measuring it. The sensors cut out at X28. The biggest X-class flares are by far the largest explosions in the solar system and are awesome to watch. Loops tens of times the size of Earth leap up off the sun's surface when the sun's magnetic fields cross over each other and reconnect. In the biggest events, this reconnection process can produce as much energy as a billion hydrogen bombs. If they're directed at Earth, such flares and associated CMEs can create long lasting radiation storms that can harm satellites, communications systems, and even ground-based technologies and power grids. X-class flares on December 5 and December 6, 2006, for example, triggered a CME that interfered with GPS signals being sent to ground-based receivers. NASA and NOAA  as well as the US Air Force Weather Agency (AFWA) and others -- keep a constant watch on the sun to monitor for X-class flares and their associated magnetic storms. With advance warning many satellites and spacecraft can be protected from the worst effects. On August 9, 2011 at 3:48 a.m. EDT, the sun emitted an Earth-directed X6.9 flare, as measured by the NOAA GOES satellite. These gigantic bursts of radiation cannot pass through Earth's atmosphere to harm humans on the ground, however they can disrupt the atmosphere and disrupt GPS and communications signals. In this case, it appears the flare is strong enough to potentially cause some radio communication blackouts. It also produced increased solar energetic proton radiation -- enough to affect humans in space if they do not protect themselves. There was also a coronal mass ejection (CME) associated with this flare. CMEs are another solar phenomenon that can send solar particles into space and affect electronic systems in satellites and on Earth. However, this CME is not traveling toward and Earth so no Earth-bound effects are expected. Thanks for this news report and a reminder that reality violates a basic assumption of AGW: The Bilderberg model of a stable, homogeneous Sun in hydrostatic equilibrium . Earth's heat source is violently unstable and exerts dominant control over Earth's constantly changing climate [2,3].